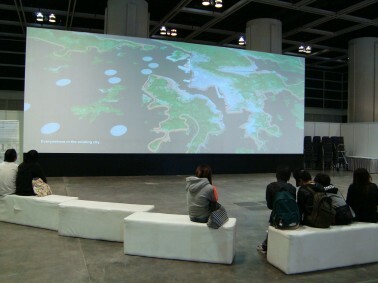 At the Business of Design Week (BODW) ‘The Why Factory’ presented visions for the future of Hong Kong, ‘Hong Kong Power’. ‘Hong Kong Power’ is an in-depth analysis of Hong Kong’s current urban, architectural and cultural situation upon which proposals for the future of the city have been developed and shown in form of a movie at this year’s Business of Design Week, 8th to 13th of December. This movie has been the result of the joint studio ‘Hong Kong Fantasies’ held in October 2008 at the Chinese University of Hong Kong. The joint studio has been organized and developed by The Why Factory together with the International Forum on Urbanism (IFoU) in collaboration with the Berlage Institute Rotterdam, the Technical University of Delft and the Chinese Hong Kong University. The study has been financially supported as part of the ‘Open Minds’ program by the Dutch Ministry of Economy.